Leading retailer BEAMS Co., Ltd. has embarked on a branding business for other corporations and products from other companies. Using the local subsidiary it has established in the United Kingdom, it has begun introducing products and contents made by Japanese corporations and local governments to the overseas market, providing support for advertisement production and business development, as well as providing support to overseas corporations and brands that wish to break into the Japanese market. By harnessing the expert eye, editorial skills, and networks it has developed as a speciality store with a history of more than 40 years, BEAMS is building a new business in supporting corporations and brands that seek to open up markets in Japan and overseas. In November 10 last year, it established BEAMS & CO UK, in London with capital of 6 million yen. Eiji Kaneda, Executive Officer and Director of Corporate Planning at BEAMS, serves concurrently as Chief Executive Officer (CEO) of BEAMS & CO UK. The flagship business of BEAMS & CO UK is providing support to Japanese clients seeking to expand their business overseas, introducing Japanese products and culture to overseas corporations, and promoting such Japanese products and culture in the local market. In addition to producing and managing artists in areas such as music and illustration, it will also engage in sales promotion work including advertisement production. Support will also be provided to corporations, brands, and artists wishing to enter the Japanese market. BEAMS Co., Ltd. generated sales revenue of 74.45 billion yen in FY2016. In addition to launching stores in Japan, it is also opening stores overseas with a focus on Asia. However, the appeal of a speciality store lies in its ability to edit and sell products that it has procured through its own discerning eye; regardless of the higher level of originality, it is difficult to create a BEAMS store overseas with a similar product line-up as the stores in Japan. On the other hand, the track record that it has established to date in procuring items overseas has helped BEAMS to build ties with local corporations, and opportunities have increased for it to apply its know-how as a speciality store, outside of the trade that it conducts in its own stores. 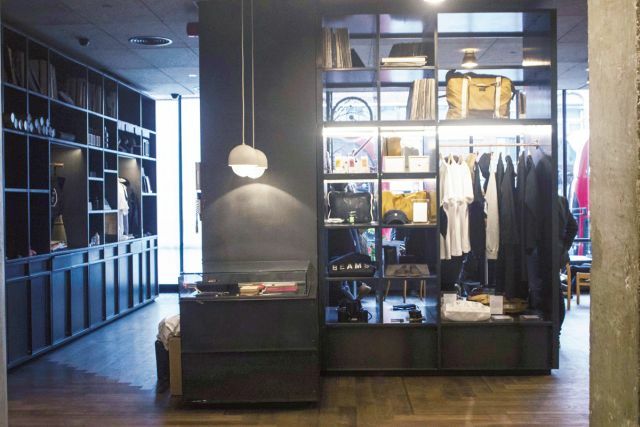 These include the introduction of Japanese brands at booths manned by BEAMS at exhibitions and fairs held overseas, and the provision of support to MR PORTER, an e-commerce company specialising in men’s fashion, to procure products in Japan. Last year, the BEAMS JAPAN store in Shinjuku underwent a refurbishment based on the theme “Rediscovering Japan,” and launched an initiative to introduce a wide range of excellent Japanese products, including non-fashion products, in the store. As a result of this initiative, the company received more inquiries from corporations and local governments seeking assistance and support in their efforts to break into overseas markets. Today, fashion is gradually becoming less of a core interest to consumers. As President Yo Shitara constantly says, “I hope that the human resources and networking capability developed by speciality stores can also be applied to other areas of work besides that of selling clothes, and I would like an even wider range of industries to learn of the existence of BEAMS.” The establishment of the local subsidiary could be described as the first step toward achieving that goal.